Leaving for Key West. Rain all the way. A stop to take pictures. Clear skies upon arrival. Old Town Garage-Park N’Ride. Oysters not ready at Pepe’s. Half Shell Raw Bar. Oysters and bloody mary to start. Conch ceviche. Raw platter. Walking off my food. Heading to the Southern point. Wanting cigars. Dipping my feet in water. Cold. Walking in the shade. Kermit’s Key West key lime pie. Rodriguez Cigars. Danny the owner. A sampler. On the beach talking with Eli, Dakotah, and Margarat. Back to Pepe’s for happy hour. Oysters and a margarita. One funny oyster. 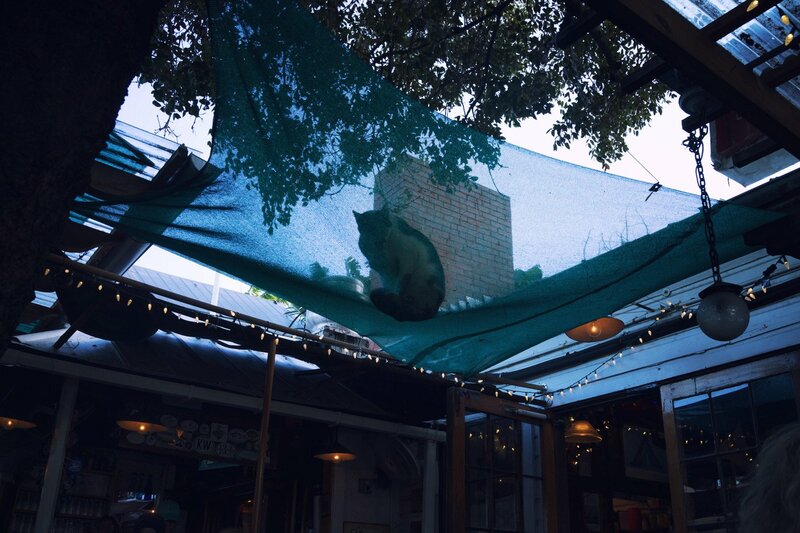 Cat in a hammock. Looking at all the resin at Key West Marine Hardware. The long dark drive to Miami Beach. Expensive parking. Joe’s Stone Crab. Tucker and Isla! Need to pee. Isla buys me a Manhattan. Art talk. Isla goes pay for parking. We get seated. Sustainable claws. Buttered vegetables. Lot’s of claws. Tucker loses his appetite. Isla still wants key lime pie. Wonderful crust. Good bye. Ronnea gives a history on airplanes. Sleep. Writing for jobs and residencies all day. Flight delayed all day. Late night to home. Lyft. Night.